As some greyhound racing tracks in Florida begin to close before the 2020 deadline, adoption groups say dogs are scarce. 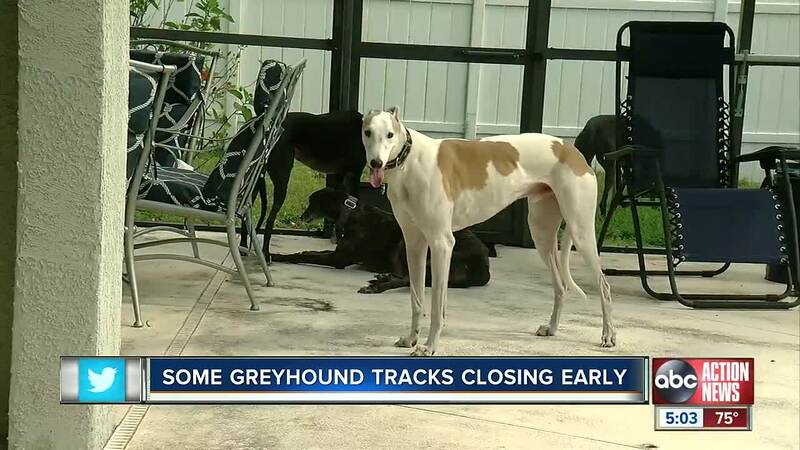 RIVERVIEW, Fla. — As some greyhound racing tracks in Florida begin to close before the 2020 deadline, adoption groups say dogs are scarce. So far, three greyhound racing tracks have shut down. "We can't get dogs and you'll find that most of the rescues are in the same situation,” said Don Goldstein, Greyhound Rescue Adoptions of Tampa Bay. Don Goldstein runs Greyhound Rescue Adoptions of Tampa Bay adopting out rescued racers for more than 20 years. "And what happened was, and we didn't really know this is, they stopped breeding or at least curtailed it to a large degree,” he said. The passage of Amendment 13, which phases out all 11 of Florida's greyhound racing tracks, means adoptable dogs are scarce right now and some seasonal tracks are cutting back on races already. "One track has cut down their schedule by half. We understand that Sarasota, this will be their last season, ending in May,” said Goldstein. They tracks that have already closed are in Melbourne, Hollywood and Pensacola. Which means 8 are still operational. A spokesperson for Derby Lane in St. Petersburg says they will race dogs until the December 31st, 2020 deadline. Meanwhile, Goldstein says racers are still dying on tracks. A death report provided to ABC Action News by GREY2K shows that on December 1 at the Sanford Kennel Club a greyhound named “Royal Tempest” got tangled up with other dogs, tripped and tumbled head-first in the rail, dying instantly. "Broke his neck and passed away immediately,” Goldstein said. When we tried to find the race online at www.trackinfo.com , a web site that posts races across Florida, the video was not available. Deaths like these make Goldstein even more determined to get the word out that dogs will need homes soon enough. "You're just going to have to be patient. The dogs are still there. They will become available,” he said.